Goju Sabudo-Kai Martial Arts Academy is a Martial Arts School offering Goju Ryu Karate classes in Grover Beach, CA for kids, men and women. Goju Sabudo-Kai Martial Arts Academy is Located at 151 North 7Th Street. View a Location Map, get Directions, Contact Goju Sabudo-Kai Martial Arts Academy or view program details below. If you are a student at this school, help your local Martial Arts Community by writing a Review of Goju Sabudo-Kai Martial Arts Academy. You can also help your school by sharing it on Facebook, Twitter, Google+, Pinterest etc. This is a Mentoring Program for kids from ages 10years and up. We offer classes from Wednesday - Saturday from 4:30-6:30pm. These are semi-private classes and 2 hour session. We offer the adults self-defense, as well as traditional Martial Arts. There is one instructor, and Jesus has been inducted in the WMAHF 2005,2007,2009,2011. Last year Jesus received his degree in Asian Studies of Martial Science and Martial Arts Science, which gave him the title of Dr. Jesus Sanchez, PH.D.
Would you like more information on hours, classes and programs available at Goju Sabudo-Kai Martial Arts Academy? Please contact the school with your questions. Update the details, Write a Review or Report Error of Goju Sabudo-Kai Martial Arts Academy. View all Dojo in Grover Beach or in Zip code 93433. This Chart shows the Martial Arts Styles offered most in Grover Beach, California area. 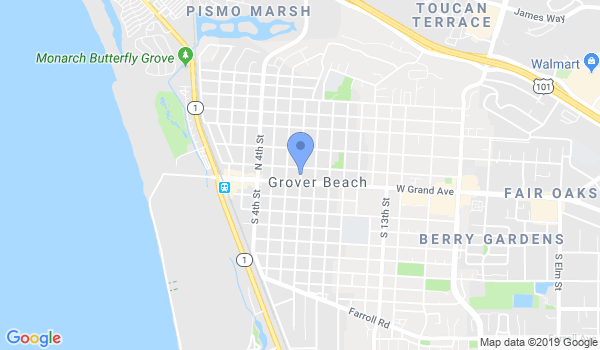 View a list of Dojo in Grover Beach, or enter your address below to find schools closest to you.